A while ago I watched a video with my cousin. The video was called the Star of Bethlehem. You can buy the DVD here. While I would suggest buying it, you can find everything the guy talks about on the DVD and more, for free on his website. The guy, is Fredrick Larson. I wont give his whole history but basically he took clues about the star from the Bible, bought some night sky software and tried to find something that fit. That’s really an oversimplification but it will do for this post. 3 It had a connection with the Jewish nation. 4 It rose in the east, like other stars. 5 It appeared at a precise time. 6 Herod didn’t know when it appeared. 7 It endured over time. 8 It was ahead of the Magi as they went south from Jerusalem to Bethlehem. 9 It stopped over Bethlehem. Before watching this program I was leaning towards the Star of Bethlehem not being an actual star but something more like the pillar of fire that guided the Israelites. But Mr. Larson proposes that Jupiter(considered a moving star in ancient times) was actually the Star of Bethlehem. And I find is reasoning compelling. I’m only going to give a quick summary of Mr. Larson’s ideas and expound on my own discovery. One important piece of information in dating Christ’s birth is the death of Herod. Many scholars date Herod’s death to 4 BC. However Mr. Larson along with other scholars claim this is a translation error and that Herod died in 1 BC. This is important because in the years 3 and 2 BC some spectacular celestial events took place. Josephus said that Herod died after a lunar eclipse. The 4 BC date can be supported by a partial eclipse in that year. 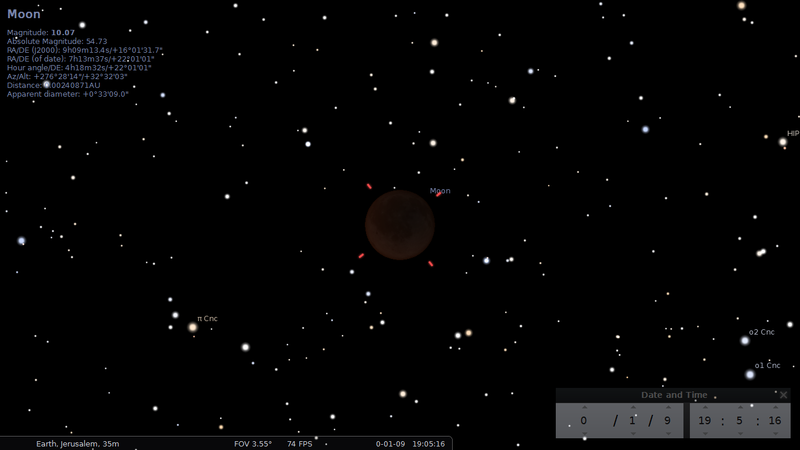 But the 1BC date can also be supported by a total lunar eclipse on January 9, 1BC. Mr. Larson discusses how Jupiter, the King planet, began a retrograde motion around Regulus, the King star. Retrograde motion is where a planet or or celestial object appears to move backwards along it’s orbital path. This phenomenon occurs because we are viewing the stars and planets from earth, which is itself orbiting. It is like watching someone walking forward as you drive past them. Even though they are moving forward they appear to you to be moving backwards. When viewing Jupiter from earth it will move forward for a time and then slow down and move backwards. The backwards motion does not last as long and Jupiter again moves forward. Jupiter retrogrades over or near Regulus about once every twelve years. However the retrograde of Jupiter past Regulus during the years 3/2BC may have signaled one of the most significant events in human history. 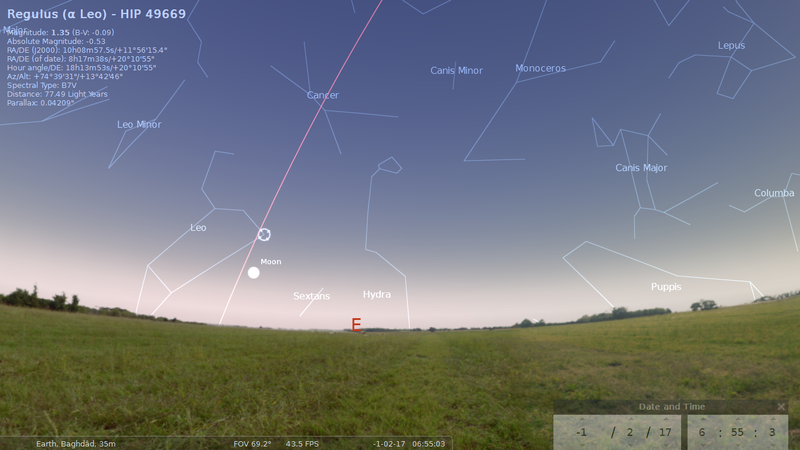 On September 14, 3 BC Jupiter passed Regulus. Then on November 23, 3 BC Jupiter stopped its movement to the left(using the image as reference). After this date it began to move right. 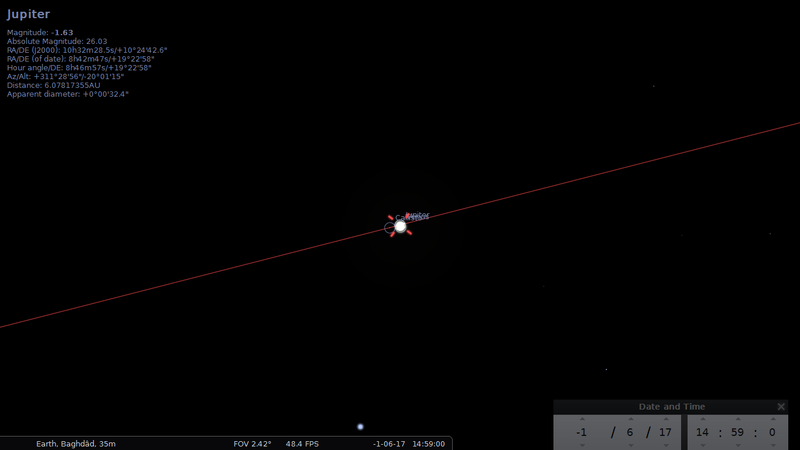 Then on February 15, 2 BC Jupiter passed Regulus moving to the right. March 26, 2 BC Jupiter stopped its movement to the right and began moving back to the left. It would therefor move past Regulus once more as it continued its path in the sky. Mr. Larson notes how similar this action is to forming a ring or crown over Regulus. He calls this the coronation of Regulus, thus symbolizing a King. Also Regulus is a star that forms part of the constellation Leo. Leo or a lion is the symbol of the Tribe of Judah. Mr. Larson is a Christian and I presume he does not accept the Book of Mormon as scripture. However I do. And this is where I will present my own observations. In the Book of Mormon Samuel the Lamanite prophecies about the birth of Christ. He prophecies that the day before Christ will be born the sun will go down but there will be no darkness. Then the sun will come back up and it will be as if it was one day. The the next night a new star would arise and there would be signs in the heavens. First I would like to discuss my discovery as it relates to the star. After that I will talk about the night that was light. While using Stellarium to examine Mr. Larson’s observations I thought it would be interesting to switch my location from the middle east to North America. So with my observation point in New York I watched the same events that I had just watched. What I saw was amazing. If we look at the sky from the middle east on the night of February 16, 2 BC we see Jupiter and Regulus about to set. Notice that the moon is to the right of the two. Then as night begins to fall on the next day, we see the moon rise but now it is to the left of Jupiter and Regulus. But if we switch to New York we see the moon rising to the right of Jupiter and Regulus. It is the beginning of the night of February 16, 2 BC. At the end of this night the moon sets on the left of Jupiter and Regulus. But in between, when the moon, Jupiter, and Regulus were highest in the sky a spectacular event took place. Something I think would have amazed and been seen as a sign to those observing it. 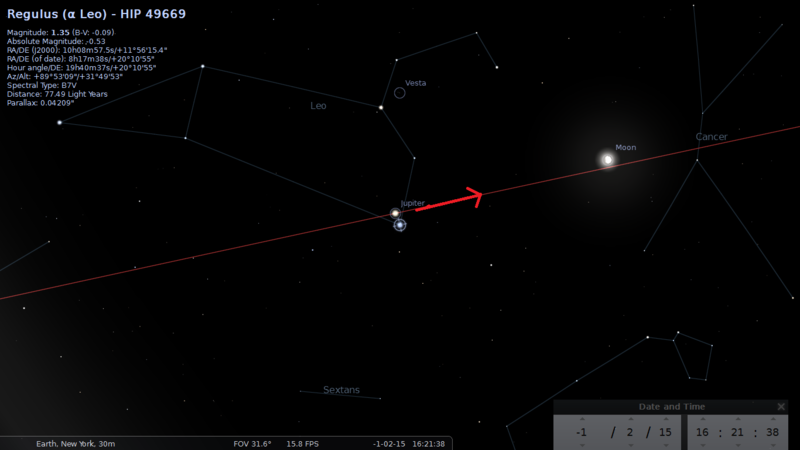 The event that occurred was a perfect alignment and conjunction of the Moon, Jupiter, and Regulus. Here is a close up view of the event. The Moon, Jupiter, and Regulus are not only in perfect alignment, but they are very near to each other and are nearly at the highest point in the sky. 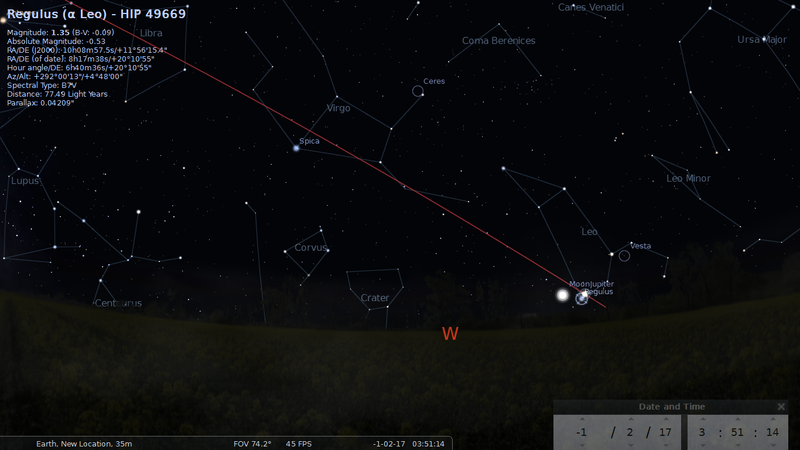 This event, appearing high in the sky, is only visible from the Americas. I believe this event is a fulfillment of the prophecy of Samuel. As such it also gives us the birthdate of Christ as February 16, 2 BC. 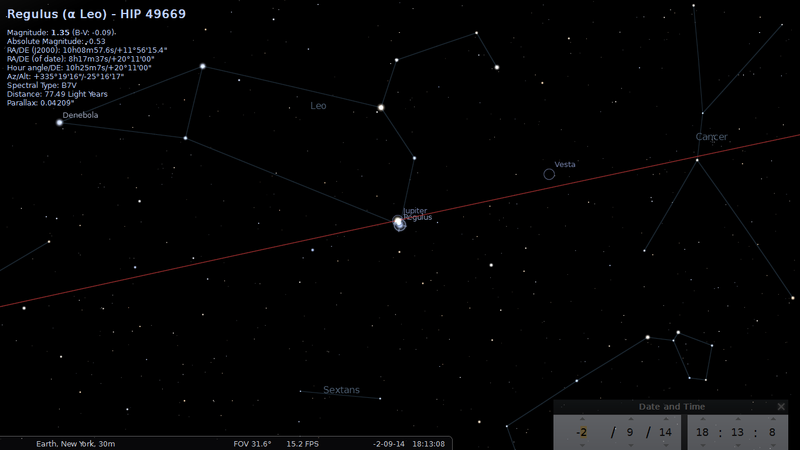 According to the signs which I have observed using the Stellarium program I believe this is the birth date of Christ. 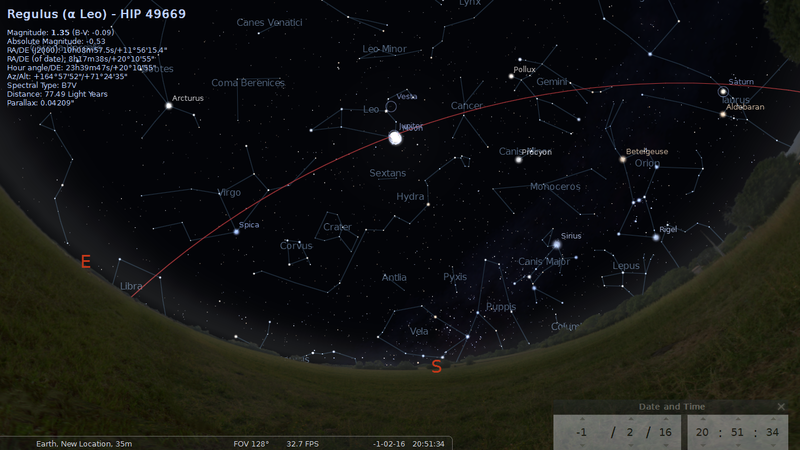 While there is nothing in Stellarium that explains this event I believe it is explained by another event. I pondered about what could possibly cause the sky to light up without the sun. My first thought was a full moon. But while full moons are bright they could hardly match the scriptural description of the event. Then I thought of the Northern lights. They light up the sky. But then again it doesn’t really look like day time. In all the pictures I’ve seen they are just streaks of light in the sky. But then I discovered an interesting event. On September 2, 1859 there was a massive solar storm. 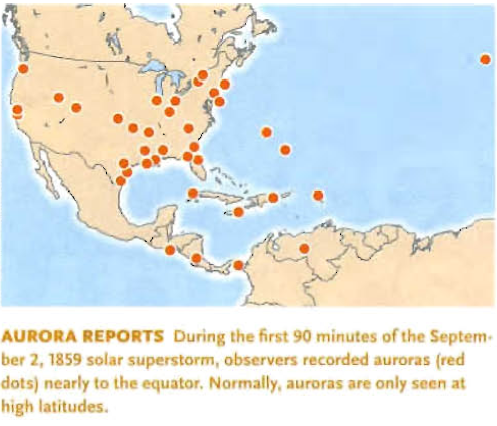 This storm caused aurora to be seen as far south as the equator. This is the largest auroral event recorded in history. According to records from the time the aurora was visible all night. But what if an event of this magnitude or greater occurred back on the night of February 15, 2BC? 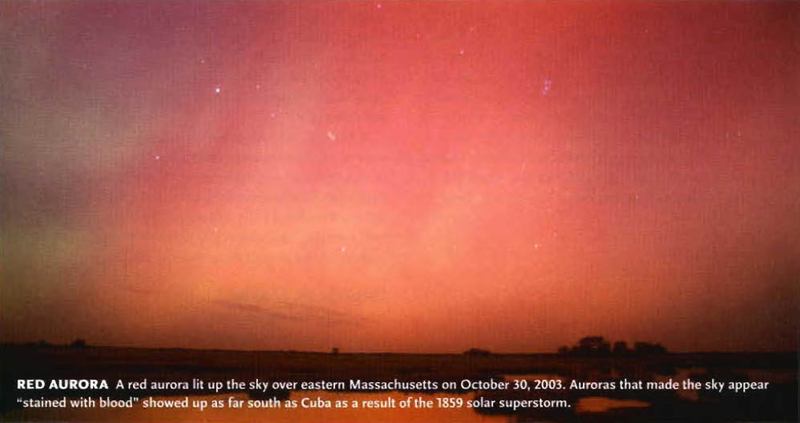 Here is a picture of an aurora that occurred back in 2003. This aurora is no where near the intensity of the 1859 one. Yet look how it lights up the sky. Now imagine the 1859 event being even brighter than this. Then imagine the 2BC event even brighter still. 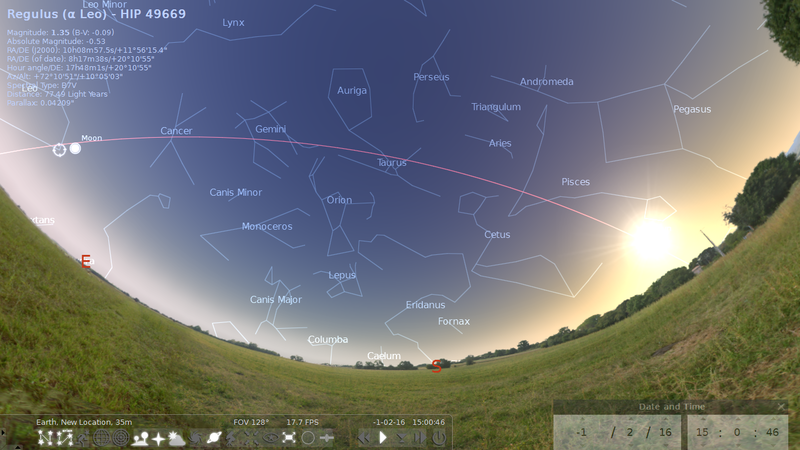 It then becomes easy to see how the sun could go down and the night would appear as day until the sun came back up. Granted this is all speculation and I don’t have anything to back up my theory. But it is an interesting thought. Lets say that the aurora phenomenon did cause that event. 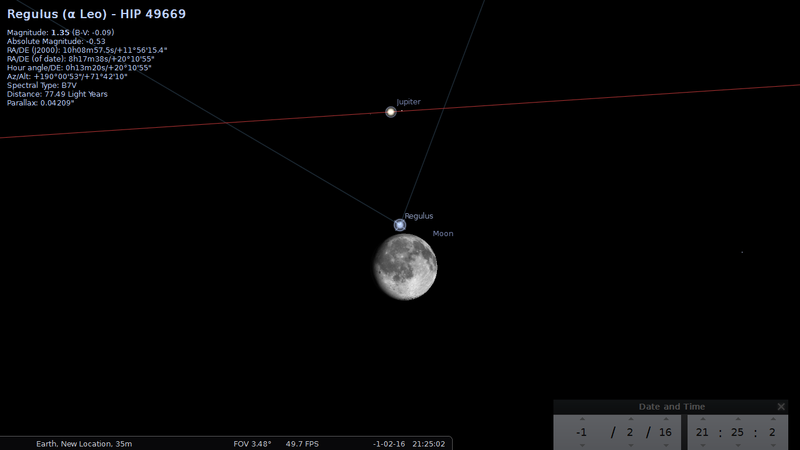 Then the next night Jupiter, the king planet, Regulus, the King Star, and the moon align perfectly high in the sky. Throw in a meteor shower or something and this event could have been one that no inhabitant of the America’s had seen before. And it would have fulfilled prophecy. Another interesting event occurred on June 17, 2BC. It was this alignment of Jupiter and Venus. Mr. Larson associates this sign with the birth of Christ and the previous event with His conception. I disagree however. I don’t have an alternative explanation for this sign though. So I’ll leave it up to you to decide. The star is described as stopping over Bethlehem, thus showing the Magi where the Saviour was. But how could a star stop. Well, if the “star” is the planet Jupiter then its stopping can be explained by retrograde motion. When the planet Jupiter moves along its orbital path is must stop its forward motion to begin its retrograde. And we find Jupiter doing this exact thing on an interesting date. 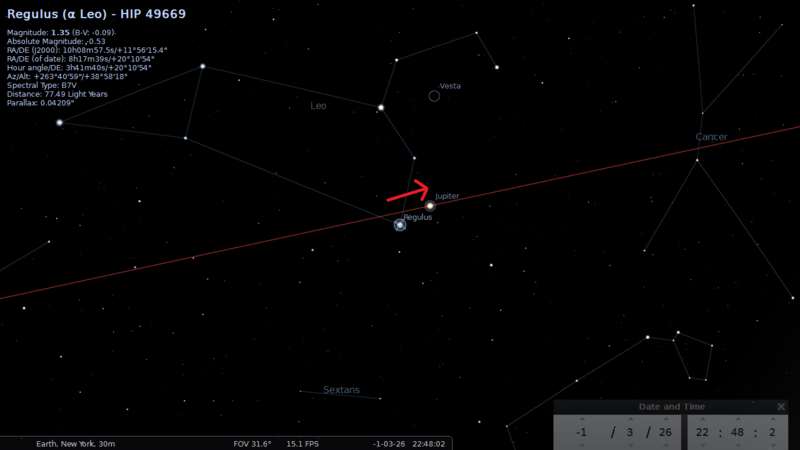 On December 25, 2BC Jupiter began another retrograde motion. If viewed from Jerusalem, this would have occurred towards the south over Bethlehem. Mr. Larson also found an eclipse that would have occurred at the time of Christ’s death. 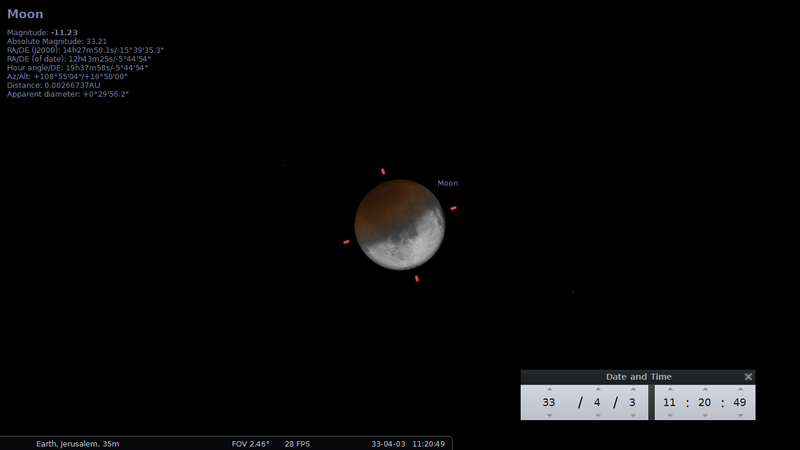 On April 3, 33AD there was a partial Lunar Eclipse. It is possible that this was the date the Christ died on on the Cross. If Christ was in the Spirit prison for 3 days the date of his resurrection would be April 6, 33AD. 1And there appeared a great sign in heaven, in the likeness of things on the earth; a woman clothed with the sun, and the moon under her feet, and upon her head a crown of twelve stars. There is an interesting celestial movement that occurs about once a year. 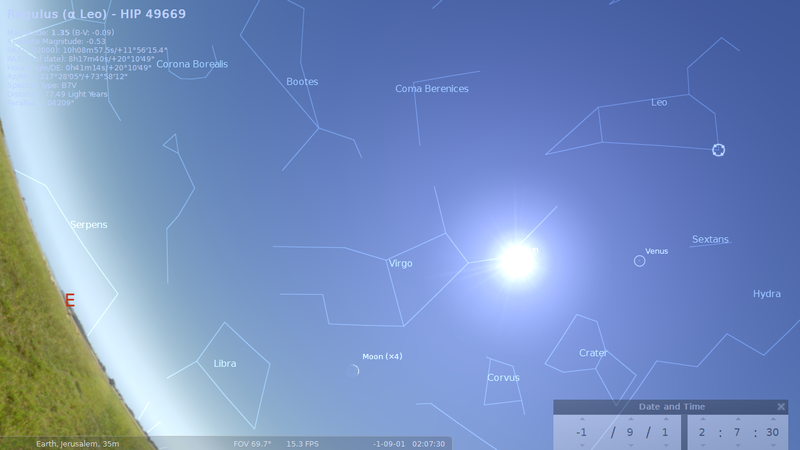 The Sun moves through the constellation Virgo. And at the feet of Virgo is the moon. Virgo the virgin is clothed in the sun with the moon at her feet. As for the crown, I don’t know what it is. Is this the basis for what John saw? I encourage you to read Mr. Larson’s webpage. He goes into much greater detail than I could. But he wont tell you about the Book of Mormon stuff though. The stars and planets really do testify of God’s works. I think we are missing a huge part of the picture if we forget to look to the heavens for signs and symbols. As those who are to bring the gospel to our fellow gentiles and the Jews we should be the first ones to notice these things. But maybe we are too distracted by the big city lights of Babylon. I hope all of you will take time to look to the sky for the signs of God’s work. As we get closer to the second coming of Christ more and more signs will be visible in the skies and it will be up to us to read them. Note: The BC dates on my images are off by one year. This is because Stellarium has a year 0. So when Stellarium reads the year as -1 it is really 2BC. This entry was posted in Jesus Christ and tagged Bethlehem, birth, Jerusalem, Jesus Christ, Jupiter, king, moon, Mormon, Nephite, Regulus, sign, star. Bookmark the permalink. As such it also gives us the birthdate of Christ as February 16, 2 BC. 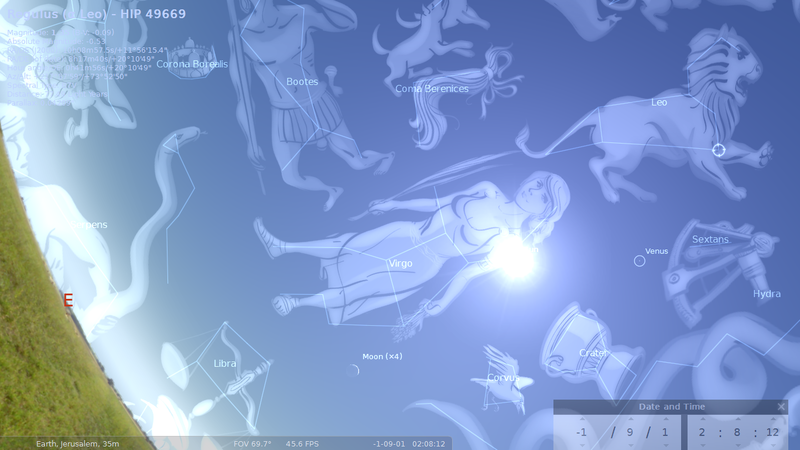 According to the signs which I have observed using the Stellarium program I believe this is the birth date of Christ. I’ve seen Fredrick’s DVD also, but I’m not sold on a winter birth of Christ — per the LDS and non-LDS evidence for a spring birth. Also, on the subject of moon-to-blood/woman clothed in the sun/etc. imagery — are you familiar with another Larson — Anthony Larson? What evidence is there in LDS about a spring birth? (P.S. I believe that D&C 20:1 is merely referring to the year, and not the actual date, of Christ’s birth, even though the vast majority of LDS would disagree with me). By LDS and non-LDS evidence, I meant LDS/non-LDS sources — I was not referring scriptures [although there is the point about shepherds not having their flocks out in pasture during winter nights], but was referring to articles, etc. like the information Fredrick Larson worked up. [P.S. — It was sure convenient to be able to dismiss D&C 20:1 with a simple “P.S. I believe that D&C 20:1 is merely referring to the year, and not the actual date” — is there no other evidence you could provide for this point, other than a statement of belief? More often than not, I’ve found that Christians who try and sell a winter birth by one means or another are trying to defend Christmas as Jesus’ birthday — which is a fight that I have no interest in. Yeah, I didn’t research the other aspects of this. My point was mainly to offer my findings about the alignment over the Americas. I found it interesting that December 25 did show up as the start of one of Jupiter’s retrogrades but other than that it doesn’t seem to have any significance. I used to think April 6 was the birthdate because of D&C 20:1 and other statements. But I do not agree anymore. If Christ was born in 4BC like scholars propose then D&C 20:1 should read 1833 not 1830. Also if it was 2BC like I proposed then it should have read 1831. But it seems that D&C 20:1 is just using a statement to refer to our common calendar like, “Year of our Lord.” I believe a similar statement occurs elsewhere in the D&C. I was surprised to see April 6 show up as three days after that eclipse. But it doesn’t really matter to me what day Christ was born on. I’m just glad he was born. Someday we will know the day but I think at that time it will be a pretty insignificant thing. I don’t know, maybe Christ’s birthdate is one of the mysteries we are supposed to seek after. All I’m saying is that D&C 20:1 does not say he was born on April 6th. It seems to be pointing to a year more than a day. April 6th has some significance, but his birthday, I don’t think (is “think” a better word for you?) it was his birthday like most LDS believe. And, who says I was selling a Christmas definition just because I disagreed with the April 6th date? I think the more likely date is in September. I likewise agree that D&C 20:1 does not say Jesus’ birthday was April 6th. Just to throw in my 2 cents, in all my studies I’m inclined to think of Christ birth in the near fall as well perhaps Feast of Trumpets. The Book of Mormon seems to give credence to this as well. It is, as I suppose, common knowledge that Christ died in the spring, therefore – according to the Book of Mormon – Jesus was born in the spring. Of course, this doesn’t give a month or day according to how we measure time. And I don’t think the Jews had a set calendar like we do, but went by the moon so that April 6 (as we count it) in one year would probably not match April 6 as we count it in another year. Actually, Jesus died after he turned 33 years old. When the record says, “it came to pass in the thirty and fourth year,” it is saying that 33 years have passed and now they were in the 34th year. When you are in your 1st year, it means you haven’t, yet completed your 1st year. When in your 2nd year, you’ve completed the 1st year, and have not yet completed the 2nd year, and so on and so forth. So, for example, when Joseph says he was in his 15th year when he had his first vision, it means he was 14 years old, or had completed 14 years of age. Therefore, Jesus was 33 years old (or had completed 33 years of life) and 3 days old (or had completed 3 days of life) when the sign of his death was given. The first day of the month is his birthday. The second day of the month is the day after his birthday, making him 33 years and 1 day old. The third day of the month is two days after his birthday, making him 33 years and 2 days old. And the fourth day of the month is three days after his birthday, making him 33 years and 3 days old. At least, that’s my understanding. John Pratt has some compelling evidence that may be of interest. He is an expert in ancient calendars that are based on planets, moon, and earth. 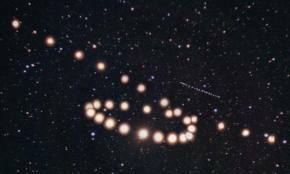 I am wondering about the planet alignment theory that you have discussed as the possible explanation of the Star of Bethlehem. It seems to me, that the wisemen would have understood the planet alignment if they really were searching the skies for the sign of Christ’s birth. Would they think a planet alignment was really a new star? It seems to me that they would have realized that a planet alignment was not a new star. I just wonder if anyone else has considered this. It seems more likely to me that the star would really have had to be something that was completely new. Is there any way to determine if a meteor shower or something like that took place at the time of Christ’s birth? Well a comet is as good a guess as any. I’m still in the research on this phenomenon. But right now I’m leaning to something more similar to the pillar of fire that lead the children of Israel rather than an actual stellar object. I haven’t read it but it sounds interesting.